Posted on June 24, 2015	by Katy K.
So more than 20 years after that now-classic book was published, McCloud has come out with a really long, detailed graphic novel that’s been getting rave reviews everywhere. Naturally I had to read it. It’s in our adult section due to being about adults and having some sexual content. 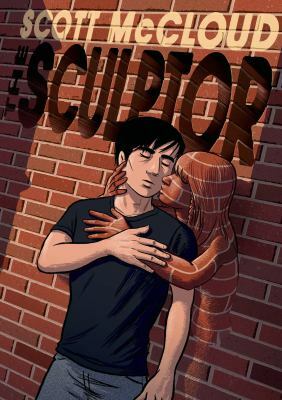 The Sculptor by Scott McCloud. First Second, 2015. David Smith is a washed-up artist with nothing left. His promising career has come crashing down around his ears, all of his family members are dead, he’s not in a relationship, and he’s about to be kicked out of his apartment. He’s spending his last money on a cup of coffee at his favorite diner to celebrate his birthday when he’s visited by someone who looks remarkably like his Uncle Harry, who died some years before. Death has chosen to look like Uncle Harry (who looked rather like Stan Lee to me), and Death is offering him a deal: 200 days to achieve the fame David so desperately wants. Then, as he’s walking home, a very solid-looking angel – wings and all – comes down from the sky, kisses him, and tells him that everything will be all right. So maybe that part wasn’t as real as it first appears – but David’s life really does start to turn around, though even the magical path to fame isn’t as smooth as David would like. This is a book that asks deep questions about the worth and meaning of both art and life. Even though I couldn’t quite personally empathize with David’s willingness to put fame above life, his struggle to make a name for himself and to stay a decent human being at the same time made me care about him anyway. I adored Meg, his muse. I couldn’t stop turning the pages, even though I had to go into the story knowing that the ending couldn’t be happy. It is excellent, indeed, and well worth the press it’s been getting. This entry was posted in Books and tagged adult fantasy, graphic novels. Bookmark the permalink.